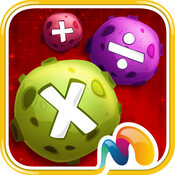 Math meets an arcade game in Meteor Math, and you’ll want to play all day! “Crash” meteors together to solve addition, subtraction, multiplication and division equations. Improve your numeracy skills as you progress through increasingly harder problems. Suitable for students of all ages… and even adults who want a fun challenge! This app is great for tutor time competition. Can be played individually or in small teams. A great way to get students alert in the morning to improve their numeracy. Mirroring the iPad using Apple TV can share the screen with all members of the group. Or, mirror using Reflector to have multiple screens mirrored at the same time. Posted on September 16, 2013, in Tutor Time Apps. Bookmark the permalink. Leave a comment.